Give your little piggies something to be excited about! We have the best selection of Pig Slippers that you'll find. We carry a wide variety of styles with a wide variety of sizes, so your entire family is sure to find the perfect fit. 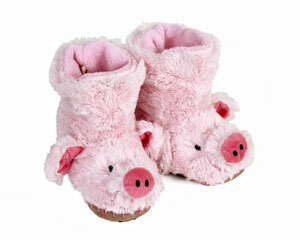 Big or small, thick or thin, our pig slippers are ready to cuddle your feet into serious comfort. The best quality and design combine with soft and plush materials to make these pigs the coziest pigs in the world. When your piggies are dead tired, give them a break with our wide selection of Pig Slippers!